Ah, springtime. Its combination of tender green vegetables and temperatures often still cold enough to allow keeping the oven at 500ºF for a few hours make it almost the perfect time to cook pizza. Almost, were it not for the fact that tomatoes are still months away. But tomatoes — while crucial to many pies — do not necessarily a pizza make. 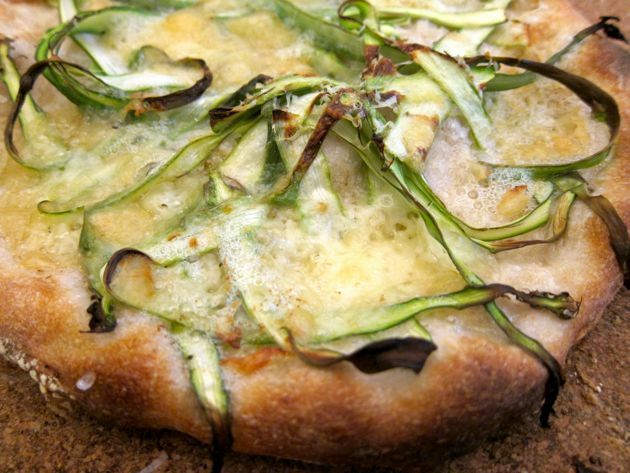 For example, there’s the asparagus pizza from Jim Lahey’s Co. (with detailed directions from Serious Eats). No tomatoes: just olive oil, shaved asparagus, parmesan and tomme de savoie cheese. The predominant flavor is that of the cheese — not quite as funky as it smells, rich and sharp. The asparagus, while not overpowering, is unmistakable as an accent at the end of each bite. And by shaving the asparagus thin using a vegetable peeler, you avoid a common pitfall of asparagus pizzas when the teeth do not bite cleanly through a spear and the asparagus and any number of pizza toppings come sliding toward your face. Shaved asparagus bites off clean. And how could I let a springtime post go by without including ramps? I used the ramp pesto I made a few weeks ago in place of traditional pesto genovese in one of my all-time favorite (and tomato-less) pizza combinations: pesto with mozzarella and goat cheese. Although it gets mellowed a bit during its stay in the oven, the flavor of the ramp pesto is intense. The goat cheese provides relief with its creaminess. 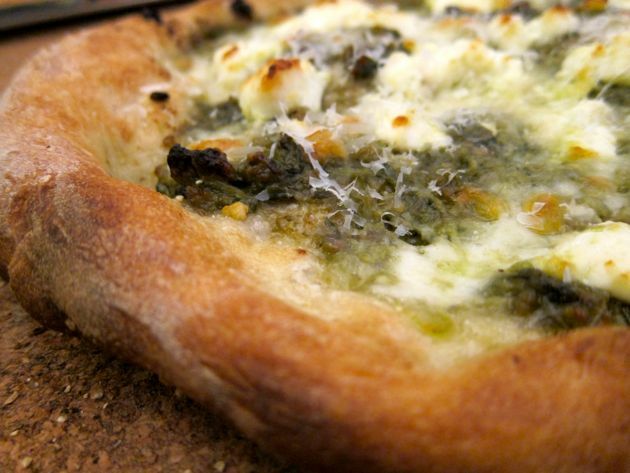 Whole ramps on pizza can behave the same way that asparagus does; grinding them into pesto prevents any undue topping slippage. I’m not such a seasonal purist that I refuse to eat canned tomatoes; on the night I made these pies I made four others involving tomato sauce. But such tasty — and unique — vegetables that are available for such a short time in the spring really deserve to be highlighted on their own. There will be plenty of time for tomato celebration in August. This entry was posted by Tom on Monday, May 10th, 2010 at 9:25 pm and is filed under Pizza. You can subscribe to responses to this entry via RSS. Oh gosh. Now I have to go make a pizza. Nice post. We all enjoyed eating these pizza creations, Tom. Outstanding!! Delicious!! A food memory for sure. Thank you for cooking for us.